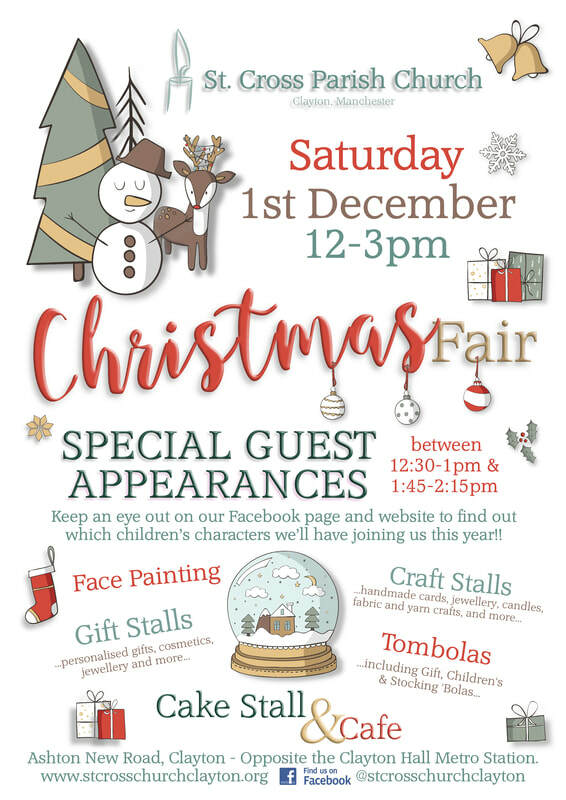 Our Christmas Fair this year will be on Saturday 1st December from 12-3pm!! As well as everything you'd expect from a Christmas Fair, we'll also have special appearances from some favourite children's characters- keep an eye on the event page over on Facebook for us to reveal who will be joining us nearer the day! !- and Face Painting to entertain the children!! This year we'll also have more stalls than ever with crafts, gifts and cosmetics stalls from local crafters and Christmas Decorations made by our Little Stars Sunday School, in addition to our regular gift stalls, tombolas, raffle and, of course, our ever-popular Cake Stall and Cafe!! We'll be sharing sneak peeks on our Facebook event page of all the wonderful goodies we'll have on our stalls on the day!! If you would like to help us spread the word about our Fair you can download a shareable image file of the poster here or a printable file here... thank you!! !